The music of Pyotr Ilyich Tchaikovsky ranks among the most popular and beloved in the classical tradition. Known primarily for his orchestral and ballet music (as well as two favourite operas), he possessed a brilliant gift for winning lyricism, passionate expressivity, brilliant colour and a blend of classic European sensibility with an unmistakable Russian character. Hardly a formalist, Tchaikovsky’s music seems to flow from instinct and inspiration that follows its own natural shape without worrying about precise classical schematics. All these traits characterize his small but worthy oeuvre for chamber music comprising three string quartets, a string sextet (Souvenir de Florence) and the epic Piano Trio in A minor. A truly one-of-a-kind work, the piano trio occupies its own unique niche apart from the standard repertoire of 19th century European trios. With its thick, rich textures, wonderful melodies, effulgent emotionality and novel form, it is perfectly characteristic of the composer, exactly what we would hope Tchaikovsky might compose. The idea for a piano trio came from Tchaikovsky’s generous and elusive patron Nadezhda von Meck who stipulated that they never meet in person. She had retained a young Claude Debussy as teacher and domestic music maker and was thrilled with a piano trio he penned while in her employ. She offered the suggestion to Tchaikovsky who reluctantly took the idea, waited for inspiration and subsequently produced a gigantic work, one of the most epic trios in the repertoire. Tchaikovsky dedicated the trio “To the memory of a great artist”, referring to his friend and teacher Nicholas Rubinstein, the founder of the Moscow Conservatory whose death in 1881 consumed Tchaikovsky with grief. It has been said that the central theme and variations programmatically describe memories of times they spent together, though Tchaikovsky denied this idea with tremendous sarcasm. But there are at least two important aspects of the trio that represent a tribute to Rubinstein. The piano part is virtuosic throughout, at times assuming important solos and occasionally resembling a chamber concerto. Rubinstein was a fabulous pianist and would probably have adored performing the trio. Secondly, the elegiac character of the work is unmistakable. The initial theme is drenched in despair and it recurs in the finale with greater force and the stark finality of the familiar funeral march. The formal organization of Tchaikovsky’s trio is novel and entirely satisfying. It may be regarded as a two-movement work though the second movement comprises two labelled sections essentially making an overall ternary design. Entitled Pezzo elegiaco (Elegiac Piece), the first movement is a sweeping narrative featuring three delicious themes in a long exposition that is repeated with some variation, an agitated coda and the feeling of improvisational development interpolated throughout. The second movement is a monumental series of eleven variations on an equally winning folk-like theme with the last section titled Variazione Finale e Coda providing a glorious, nearly orchestral apotheosis of the theme that segues into a powerful recurrence of the opening elegy and the subjugation of all light into dark grief and the bitter finality of a funeral march. The variations are nothing short of brilliant: the variety of musical treatments with their diversity of expressive character recalls the genius of Tchaikovsky’s orchestral compositions where his seemingly endless inspiration finds ample expression. Several commentators have provided an itemized description of the variations, illuminating for its interesting highlights including a music box, a waltz with a different tune but the main theme as a countermelody, an elaborate fugue, a salon-style mazurka, a delicate lament and a voluminous symphonic final variation. The rhythmic variety alone is particularly rich. In the manner of most elegies including Smetana’s trio, Tchaikovsky’s trio begins with sorrow, drifts into nostalgic reflection, then re-awakens to the present state of grief deepened by the recall of what was lost. Indeed, Tchaikovsky’s trio, published in 1882, established what would become a tradition of Russian elegiac trios including those by Rachmaninov, Arensky and Shostakovich. In the latter half of the 19th century Bedřich Smetana emerged as the first truly nationalistic Czech composer. A generation older than Dvořák, Smetana participated in revolutionary protests against the Austro-Hungarian Hapsburgs, emigrated to Sweden, and ultimately returned to Prague a prodigal son where he was celebrated for his numerous operas, orchestral and piano pieces reflecting Czech culture and identity. His personal life was difficult. Smetana buried his first wife as well as three of his four daughters who died during infancy. In his mid-fifties, Smetana developed tinnitus, eventually becoming deaf, and he ultimately succumbed to madness most likely caused by syphilis. Yet still, Smetana prevailed as a powerful artist and, to the chamber world in particular, he bequeathed two amazing works: a late string quartet and an early piano trio, both passionate epics of romantic expression deeply reflecting his personal tragedies while, perhaps through art, transcending them. Smetana wrote his only piano trio in 1855 when he was just thirty-one. He dedicated the work to his oldest daughter Bedřiška who had just died at the age of four from scarlet fever, a young girl with precocious musical talents and with whom Smetana had an especially close relationship. He was devastated. Though he left no specific programmatic description of the trio, its grief-stricken and elegiac character is unmistakable. One of the most powerful works in the literature, it is equally historical. Influenced by Eastern-European folk music with its unbridled passion, spanning rhapsodic forms full of rich thematic variation and a piano style more Liszt than Chopin, Smetana’s lone piano trio is a milestone of Romanticism. It predates and significantly presages music that would soon come from the likes of Brahms and Dvořák. The first movement is a towering force of anguish and despair beginning with broad, devastating gestures that continue to tighten and accelerate until the final bars of near mania. The sonata principle contrasts this trajectory with something completely different: a lyrical, tender second theme rising gracefully between vicious onslaughts. Smetana described this as one of his daughter’s favourite melodies. Both the dark and light subjects significantly transform throughout the movement as the emotional tenor of the music rises to panic on one hand and shining triumph on the other. This alternation between dark and light – death and daughter – vividly continues throughout all three movements in a convincing expression of inconsolable grief illuminated within by nostalgia, tragedy juxtaposed with gracious nobility. The middle movement is troubled rather than devastated. A worried scherzo unusually provides two different trios, each offsetting the surrounding gloom in its own way. The first offers a sighing, swaying melody of tender expression, the second, a march that is by turns luminous, then regal, then epic in an outpouring of bright majesty. The finale is a swift, dashing rondo with at least three powerful evocations of Smetana’s apparent musical programme. The opening “gallop” undeniably evokes Schubert’s famous Erlkönig where a father and his son race on horseback, desperately fleeing death as it reaches for the child. Between episodes of frantic motion, there are soft lyrical interludes, the sigh of a child and the gentle nobility of Smetana’s daughter’s theme from the first movement. But the end is nigh, the contest fatal. The gallop halts, confronted by the stark, timeless dread of a funeral march, the unavoidable musical teleology of the entire trio. The music is not yet over. Smetana seems determined to end on a higher plane, the nature of which is difficult to describe: a final affirmation of what eternally survives, what death could never, ultimately, take away. Founded in Vienna in 1999 with the concept of pairs coming together, the two Korean sisters, and Soo-Kyung and Jens (who are now married), have since then been exploring the piano trio repertoire with freshness and curiosity as well as with respect and reflection. In particular they have been gaining a reputation for the freshness of their approach to the core repertoire: “works by Beethoven, Schubert and Brahms are transformed in their hands into the alive-and-kicking music of today” – Esben Tange, editor at DR P2. Since its inception the Trio has won most of the international competitions for piano trio, including the ARD (Munich), Vittorio Gui (Florence) and Norway’s Trondheim Competition. In January 2015 the Trio became the first ensemble to receive one of Denmark’s most prestigious music awards, the “P2 Artists Prize,” at a live televised concert where they performed Beethoven’s Triple Concerto with the Danish National Symphony Orchestra. Other major awards received include the Kalichstein-Laredo-Robinson International Trio Award (USA) and the “Allianz Prize” in Germany’s Festspiele Mecklenburg-Vorpommern. Trio con Brio Copenhagen is in great international demand and has an intensive worldwide touring schedule. Recent appearances have included Washington DC, Los Angeles, Dublin, Hannover and Mannheim, (Germany), the Evian Festival (France), Göteborg (Sweden), Trondheim (Norway) and Copenhagen among many other cities. In recent years, Trio con Brio Copenhagen has appeared in major concert halls in Europe, the USA and Asia, such as Tivoli Concert Hall, the Concertgebouw, Carnegie Hall, Wigmore Hall, the Konzerthaus Berlin, the Seoul Arts Center, Bunka Kaikan Tokyo, and Teatro Olimpico Vicenza. Trio con Brio Copenhagen continues to play a central role in Scandinavia’s vibrant contemporary music scene. Several of Denmark’s most prominent composers including Per Nørgård and Bent Sørensen, as well as Swedish composer Sven David Sandström, have composed and dedicated works to the Trio. Trio con Brio Copenhagen was enormously honoured to be chosen by Per Nørgård to be the dedicatee of a work that was premiered at a festival in Stockholm celebrating his 80tth birthday in 2012. In January 2016 the trio presents the world premiere of Bent Sørensen’s Triple Concerto with the Danish National Orchestra. As founders and artistic directors of the Copenhagen Chamber Music Festival – a festival that is gaining more and more international attention – the trio is searching for new and interesting paths and directions in chamber music as well as initiating concerts for the young generation. The Trio’s début CD was unanimously praised by critics. 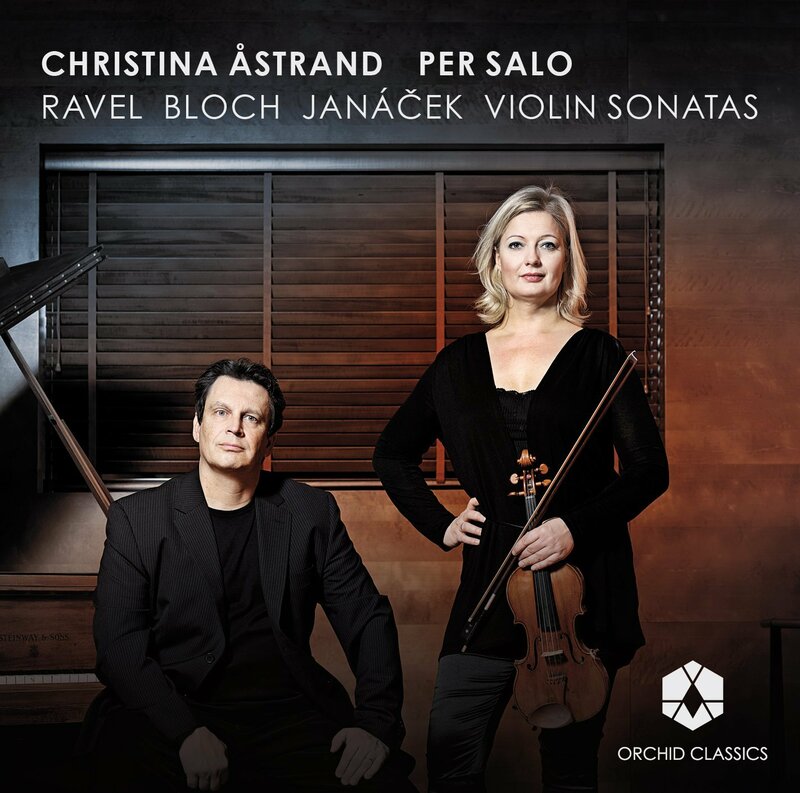 American Record Guide wrote: “One of the greatest performances of chamber music I’ve ever encountered …”. Gramophone Magazine wrote: “the performances can compete with the best available…airtight ensemble…a superb, greatly gifted chamber group.” Their Mendelssohn CD was chosen by Classic FM, UK as Chamber Disc of 2011: “Every phrase soars and pulsates with the excitement of a fresh discovery as the Copenhagen players go the full distance with playing of skin-rippling sensitivity… sensational playing…”. Their latest recording, “Phantasmagoria,” of Danish contemporary music, has also been receiving excellent reviews. Trio con Brio Copenhagen is frequently featured as soloists in Beethoven’s Triple Concerto with orchestras. In 2011 the trio premiered a new Triple Concerto by the renowned Swedish composer Sven-David Sandström with the Danish National Symphony Orchestra and Kristjan Järvi in Copenhagen’s Koncerthuset. The following year, they were invited to perform the Triple Concerto with the Stockholm Philharmonic Orchestra for Sandström’s 70th birthday concert in the Stockholm Konserthus. As educators, the Trio members teach at the Royal Academy in Copenhagen and give master classes on their international tours, including at Yale University, Rice University in Houston, and the Royal Irish Academy of Music, among many others. 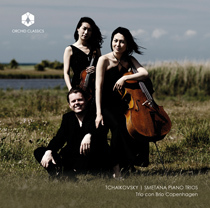 The Trio’s sound benefits from the superb instruments they play: So-Jin plays a violin built by Andrea Guarneri from the 17th century, Soo-Kyung plays a Grancino cello, and Jens is Denmark’s first Steinway Artist. Both string players are endorsed by Jagar Strings and Thomastik-Infeld Vienna. The ensemble was coached by the Alban Berg Quartet, Frans Helmerson, Mihaela Martin and Harald Schoneweg at the Cologne University of Music and received excellent musical guidance by Ferenc Rados in Budapest.